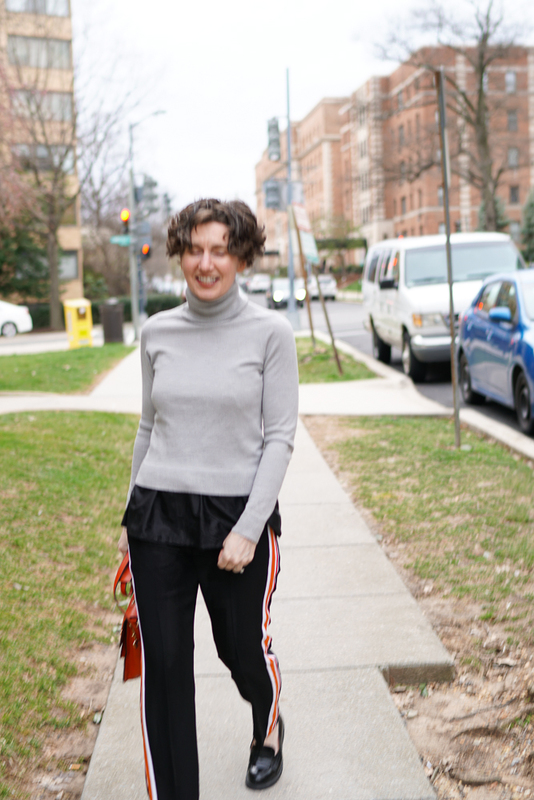 When I was preparing for our trip to Chile last year,* I thought a pair of athletic-inspired trousers might be just the thing for urban excursions. Put another way, I wanted some dressy track pants. I found a beautiful pair by Isabel Marant but they were horribly expensive and looked terrible on me. Costly and unflattering? Insupportable. I bought a cheap pair of tuxedo pants from Banana Republic and asked Fatima to appliqué some ribbons on the tuxedo stripe. In the end, the pants didn’t make the trip, but they’re kind of cute, right? The ribbons may be a little too bright and the leg is tapered ( I prefer straight legs), but they’ve got something going on. Unfortunately, they are not made of a stretch fabric, so they really cannot substitute for track or yoga pants. I haven’t worn these to work but I think they would be permissible on Casual Friday. They would be perfect for brunch if I were the brunch-eating type. Consider the possibilities one might realize while standing in the notions & trims section of G Street Fabrics. Using a light or medium grey would have been a pretty (and more versatile) alternative to these bright colors. Note how the ribbons run off the pants. I stole this idea from Jason Wu. It’s the smallest detail imaginable, but very delightful. Well . . . I am delighted. Come closer to see my knock-off better. The Directrice and The Photographer aim to have a soirée sometime this spring — a combination of literary salon and style colloquium. If you’re in the D.C. area and would like to come, please leave a comment to that effect and we’ll invite you when we set a date. * For those interested in vacation packing or Chile, there were one, two, three, four — count them! — posts. So clever! 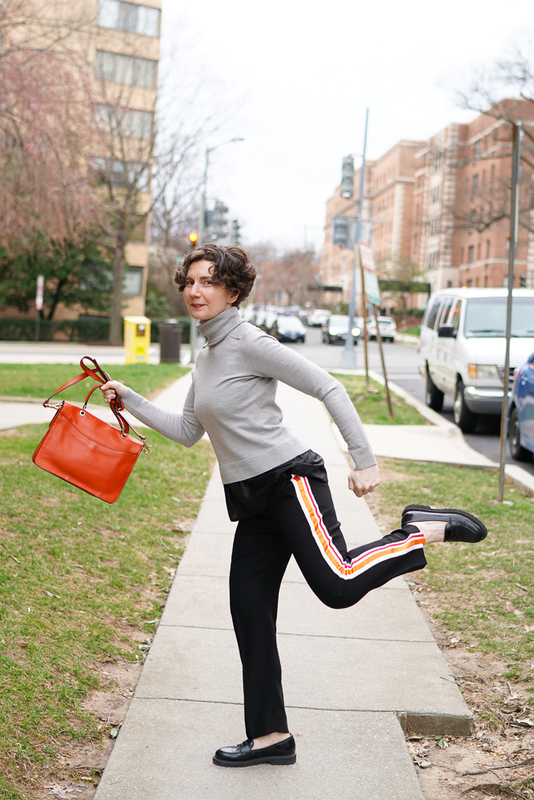 I actually love the bright stripes with the neutral colors, penny loafers, and fun bag. I hope you plan to gussy up more pants? I’d love to see what creativity you and Fatima could come up with. So clever! You are always thinking! !!!! Please let me know when said soiree is planned! We’d love to come! Saturday, May 18th at 7:00 p.m. We’d love to see you! Please let us know when the soiree will be. If there’s enough notice, I might be able to be there, despite living outside Albany, NY. I visit my aged P frequently and could try to make the soiree. Saturday, May 18th at 7:00 p.m.! I hope the timing works. Adorable. And tapered pants look good on you! Just call me the Pants Evangelist (the Pantsvangelist?). I live in the Richmond area but would love to attend a soiree/colloquium. Saturday, May 18th at 7:00 p.m. Do come! Bring a friend so you don’t have to drive alone. 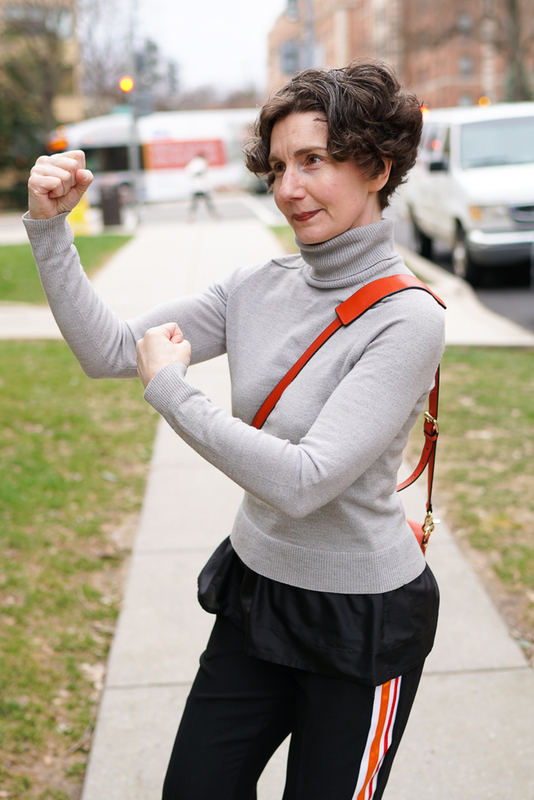 You’ll be able to see my too-loose pants in person. Oh yes please! Include me in the soiree. 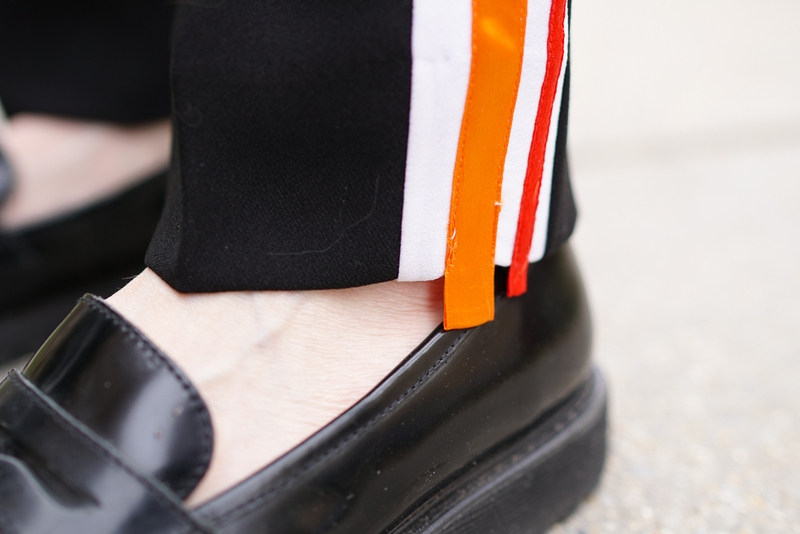 I was skeptical of the track pants with loafers, but you make the look work. Saturday, May 18th at 7:00 p.m. Look forward to meeting in person! Those pants – I dig them. I will be stealing, YES stealing this idea! Ooo! I’d love to come (my sister is in the dc area so your soiree would be the perfect excuse to visit her). Also, I love your trousers. I’m really attracted by bright stripes like that but, like you, I’m concerned about the versatility of colors and the marching-band effect of, say, a white stripe. Saturday, May 18th at 7:00 p.m. Bring your sister! The DIYer in me must know: how are the ribbons attached to the pants? Via stitching or a fusible interface of some kind? I would dearly love to attend the soirée but logistics from Ottawa would be complicated. Plus planning an outfit would require me to quit my job and focus on that full time! The ribbons are stitched, Shopgrrrl. Fatima did this very precisely, but I think that slightly crooked stripes or stitching would also be charming . . . and that’s how they would have looked had I done the job m’self. So sorry that you are too far away to come to our party, but please know that could come wearing anything! Ah yes, now that I’m looking at the photos on my tablet and not my tiny phone I can see the stitching. A very ambitious and well-executed mod! Will you try the pants with sneakers as well? Please post if you do! Would love to come if the party happens to be when I’m in DC for work next month! I have to admit the this look needs time to grow on me. Saturday, May 18th at 7:00 p.m. If the timing does not coincide, I hope you will let me know what dates you are in town so we can meet for coffee! If I am around, I’d be interested in attending a literary soiree/style symposium! Please add me to the list of interested parties. Saturday, May 18th at 7:00 p.m. Please do come! Those stripes are so clever! I was thinking of coming to your soiree, but I’ll be in France on 5/18.